Caiman free games: Untitled by Matt Thorson. 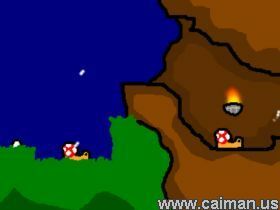 Although it may not sound like anything big, Untitled is probably one of the biggest games to be entered in the Caiman Easter 2006 competition. 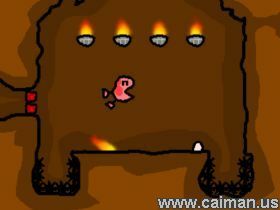 While the controls and landscape is platformer-styled, that's where the similarties between it and other platformers end. You control an egg and must explore the world around and in the tree where your nest is. This task, as you soon discover, is much harder than it may seem. There are enemies, ridges, thorns, crevasses, and much more. Of course, there are also several obvious and hidden factors that help you in your journey. The obvious blue-egg powerups are great but it is the hidden puzzles that really give this game an edge over others like it. Unlit torches, hidden tunnels, breakable objects, and even subtleties in the controls all contribute to an exhilarating experience. Overall, don't let the loading time, menu, and title (or lack thereof) put you off since underneath the somewhat rough casing, lies one of the most challenging and exciting games ever produced.